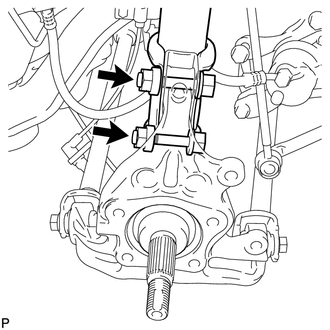 (a) Loosen the 2 bolts. 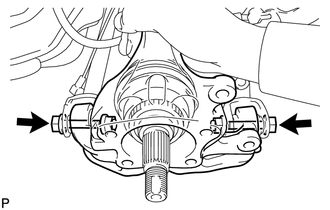 (b) Remove the 2 bolts and 2 nuts, and separate the rear shock absorber with coil spring (lower side) from the rear axle carrier sub-assembly. Be careful not to damage the outboard joint boot. Be careful not to damage the speed sensor rotor. When removing the nuts, keep the bolts from rotating. 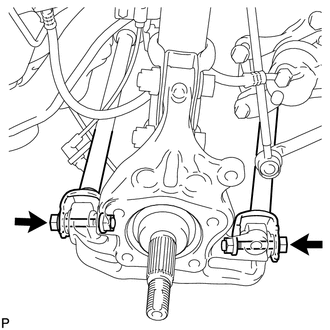 (c) Remove the 2 bolts, 2 nuts and rear axle carrier sub-assembly. Use wire or an equivalent tool to keep the rear drive shaft assembly from hanging down.